Fresh & Delicious Carmel Corn made fresh to order, makes a great gift! Don't wait for us to come to your area event! Interested in becoming a Pence's corporate account holder? Contact us to find out how! As graduations and wedding season draws near, let Pence's Carmel Corn Shoppe supply your party favors. Pence's Party favors will add the final touch to your event. You can choose from regular carmel corn or carmel corn with colored coated chocolate pieces to match your theme or school colors! Contact us today for more details! Pence's Carmel Corn Shoppe has a two unique opportunities for fundraising! Both options have a great potential to earn money for your group or cause! Contact us today to recieve a fundraising packet with all the details! 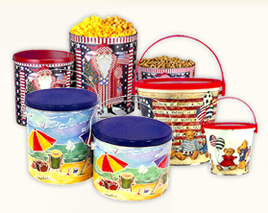 Pence's Carmel Corn Shoppe can help you find the perfect solution for all of your promotion needs. Pence's has a variety of products that can be incorporated into your event! Contact us today to discuss your options! Don't know what to get the person that has everything? Pence's Famous Carmel Corn is the perfect gift. Select any of our products from our online store and send it directly to your loved ones. Don't forget about those close by as well. Surprise someone with a gift from Pence's Carmel Corn Shoppe�today! Looking for gifts for your employees? Pence's has something that everyone loves. Contact us today for more options. Christmas is not the only time to give a gift from the Pence's Carmel Corn Shoppe. We have themed tins for Valentines Day, Easter,�Mothers and Fathers Day, Fourth of July, Halloween, Thanksgiving, Christmas, Birthdays, Just Because, Sports Parties... you name it and Pence's can deliver! Choose from our Famous Carmel Corn, Buttered Popcorn, Kettle Corn, Salt Water Taffy, SUGAR FREE Carmel Corn, Carmel Corn with Peanuts, and Chocoalte drizzled Carmel Corn! Shop online today! Get our famous Carmel Corn made fresh to order anytime, right here at our online shop or contact us today and have it shipped!